Pound chicken to approximately 1/2 inch thick. Spread cream cheese over each piece of chicken; top with 1/4 Tbsp butter, salt, pepper, and desired spices. 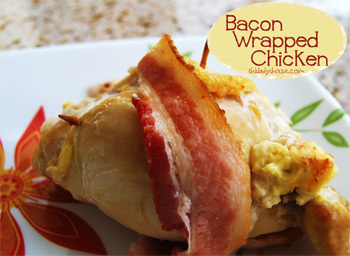 Roll up tightly and wrap with bacon, securing with a toothpick. Place seam side down on a well greased baking dish and bake at 400 degrees for 40 minutes or until chicken is cooked through.